For dinner, we were on the look for something on the student budget side. We headed to the nearby mall for our hotel again, and spotted Los jueves! Yes, it was a Thursday and my Spanish finally came to use. 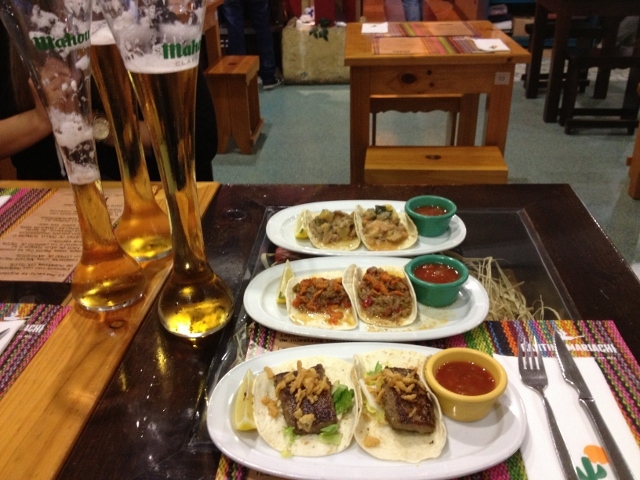 So on Thursdays at Cantina Mariachi, you can get two tacos and a beer for only 3 euros! Not bad at all! The place has a bit of a Mexican feel to it, but my god the service here is ridiculously slow. I guess I’m starting to get used to terrible service in Spain, but one would think this restaurant was more of a fast food joint. If you want to get quick food here, think again. The servers here, who are young boys walk ever so slowly and watching them move was just painful. Anyways, our beers came and they came in some pretty cool glasses. Europeans love head on their beers, contrary to what we Canadians like. We usually try to pour our beer so we get the least possible. Here, they try to get lots. Cold beer was still great for a hot day. The only thing about the deal is that you must get the same two tacos. That was fine with us though, as we all ordered something different so we could try each others. M got the Taco Ranchero, which had veal cooked with mushrooms , onions and green peppers. This was a very difficult one to eat as it was very soggy. S got the Mariachi Taco, which was beef stew with beans. Also more of a wet taco, but still flavourful. Lastly, I got the Taco Beef with Cheese, which had veal steak with melted cheese. Mine was the easiest to eat and I also really enjoyed the veal steak. It was probably my favourite. Each plate also came with a cup of salsa for you to pour over. All in all, you can’t expect much here, but the Thursday deal is definitely a steal! Just don’t expect quick service.